*Also see our 2-bedroom Mountain Springs Chalet at VRBO #369914 and our 1-bedroom Cozy Creek Cabin at VRBO #144818! This new, luxury cedar cabin sits atop a ridge in Pigeon Forge just three miles to the main parkway and all the attractions! But, when you're at the cabin, you are surrounded by the peace and quiet of the mountains and nestled among the beautiful trees and ridge tops. All wooden interior, brand new game room, new furnishings, stack stone fireplace, pool table w/ ping pong top. Guests RAVE about this cabin---come see why! We are fortunate to be able to share five (5) very special places that offer five (5) different Smoky Mountain experiences and which we personally enjoy in Gatlinburg, near Dollywood, and just off the Pigeon Forge/Gatlinburg Pigeon River Spur. We are the owners and not a management company - these are our homes. We are also blessed to know wonderful people for over 10 years who help us with cleaning, maintenance, repairs and help us solve any challenges we may encounter, which can occur by occasionally sharing our treasured cabins with our guests. Sunset Ridge is one of these magical places. 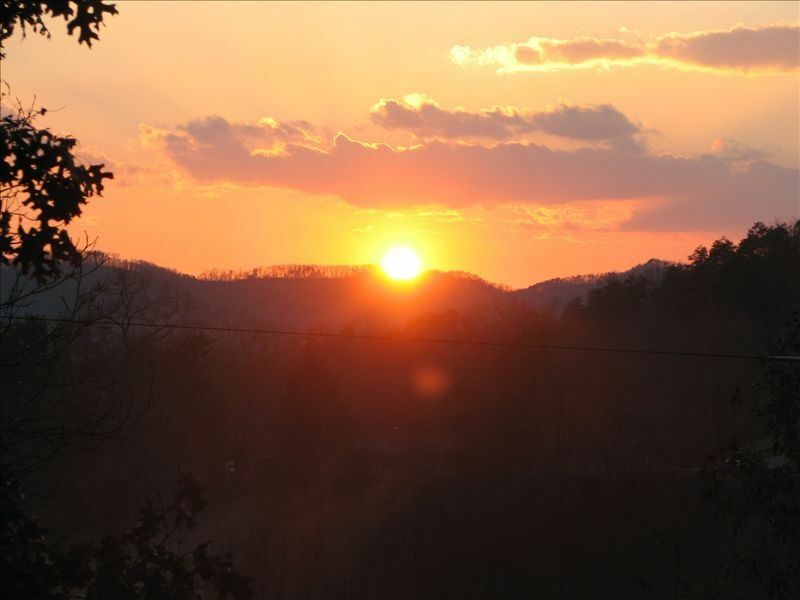 It sits on a small ridge behind Gatlinburg without steep roads and it derives its name from the beautiful sunsets from the covered front porch (and sunrises from game room and deck). It is surrounded by a large white oak, red oak, and pine tree forest. From the porch you can also hear the occasional train whistles from Dollywood. . Sunset Ridge is yours alone during your stay. We will make arrangements for your stay and you will not see nor hear from us unless it is your desire. When you do contact us, we do our very best to be accessible and responsive from the time you book with us throughout your stay with ideas and recommendations to enjoy what Gatlinburg, Pigeon Forge and the Great Smoky Mountains National Park have to offer and to address any needs and concerns. Please do not hesitate to contact us at any time prior to or during your stay. We hope you choose to arrange a stay at Sunset Ridge - and please let us know if you encounter anything that may distract you from fully enjoying your stay - we want to provide an opportunity for you to enjoy Sunset Ridge as we do. Please know that Sunset Ridge is NOT in nor near the City of Sevierville (the county seat and home town of Dolly Parton) - it is outside of the city limits of Pigeon Forge and Gatlinburg in the Pigeon Forge planning region - all cabins outside of city limits in Sevier County have a postal address of Sevierville. Sunset Ridge is located behind Dollywood down Dollywood Lane and around a few short corners. It is convenient to Pigeon Forge, the Gatlinburg Artists Colony and the GSMNP Pigeon River Parkway spur (US441/US321) towards downtown Gatlinburg and Sugarlands Visitors Center and beyond. . Sunset Ridge was Laura's original second home and we chose Sunset Ridge for its location near Pigeon Forge, Dollywood, Gatlinburg and the Great Smoky Mountain National Park. Sunset Ridge is a spacious, modern cedar cabin with a tongue-and-grove interior, a large game room, jacuzzi, large covered porch, large wrap-around deck, a secluded campfire fire pit, and beautiful woods. We hope you will also appreciate this beautiful cabin as we do when we regularly stay at Sunset Ridge. Enjoy its convenient location to the attractions in Pigeon Forge (including Dollywood,) and Gatlinburg as well as the natural and historical sites in the Great Smoky Mountains National Park. Also enjoy returning to Sunset Ridge's seclusion, peacefulness and spaciousness. Share our joy rocking on the covered front porch, relaxing on the deck or sitting by the fire pit enjoying the trees, the flowers and the wildlife outside. Inside, enjoy the jacuzzi and the jetted tub or sit by the fireplace or in the game room enjoying the views outside and the internal décor. Large wrap-around deck/porch, lots of outdoor furniture, outdoor fire pit for campfires, private yard, beautiful trees--incredible sunsets! The host was very helpful and a great host. The place was clean and very cozy. We really enjoyed how spacious the cabin was. The views are beautiful. Very pleased overall and would highly recommend! Thank you, Lauren! We are so happy you came and enjoyed Sunset Ridge! We hope you will come again! Very dated, not clean to my standards and I’ve stayed at several different cabins and resorts in the area that were clean and updated....TOO rustic for my taste so we cut our trip short! We are sad to read your very mean and inaccurate review of our family vacation cabin. A single star is an obvious insult and not an accurate nor helpful rating (our average rating is near 5 stars). Sunset Ridge is a modern, up-to-date cabin. Furnishings are new and relatively new and the cabin has all the comforts of home. It’s our vacation home, which we love dearly and take pride in. We also take pride in the fact that our cabin is a wonderful and joyful experience for our guests. We are NOT a management company. This is our mountain home. It’s furnished with expensive, mountain-style décor and furniture - log frame bed, tables, large leather sofas, new bedding and mattresses, etc... We did have temporary cleaners (as our long-term cleaners were attending personal matters), so if the cleaning was not up to par, it would have been nice to know. We will certainly question using this cleaning service in the future. If you had contacted us, we would have been more than happy to have cleaners come back and make things right for you, order you pizza, whatever we could have done! We go out of our way to make sure our guests have an amazing time and that everything is perfect for them! We’re sad we were not given the opportunity to do so in this (most rare) case. We hope you find happiness in your future travels together. The house was warm and inviting, plenty of open space, we were able to cook Blue Apron in the kitchen and gather around the fireplace. It was comfortable and we would go again. The steps were a bit much for one of the grandmas, but once she was in the house it was all good! Walkway to stairs is a little steep! Place was clean and well equipped!! We evacuated the coast due to hurricane Florence. This owner communicated quickly and got us in with no problems. They were available for questions during our stay and had a well maintained cabin for our family to enjoy during the tough time. We can't thank them enough for their generosity and help. Thank you so much, Courtney! We were happy to have you and provide some peace during a trying time. We hope you will come again soon! The cabin was wonderful, exactly like advertised...in fact even better in person!!! Thank you Laura and Stewart for letting us stay in your cabin for a wonderful week, and for promptly taking our phone call and talking us through how to get the televisions on!! We loved everything about it, and your description of everything was spot on. Some of the things we enjoyed were hearing the Dollywood train and watching the Dollywood fireworks from the porch nightly. The cabin was perfectly furnished, as there were things available for all ages to enjoy, from the kids games/puzzles, magazines, movies, books and our particular favorite..the stereo with the record player! The beds were very cozy and comfortable and the jacuzzi in the master was much larger than it appeared in the photos.It was nice that the bedrooms were on separate sides of the cabin, so we had privacy from the other couple.The kitchen was furnished with every possible utensil you may need plus some! I think you two thought of everything when you were furnishing your cabin... The only thing I couldn't find when I was sweeping the kitchen floor was a dustpan... but I probably just missed it! We also loved the proximity to Pigeon Forge and Gatlinburg, it was a very short drive everywhere and it was nice being so close to everything, expecially Patriot Park to catch a shuttle if you wanted to. I befriended a medium sized red dog that had no collar and appeared to run loose in the area. Although very skittish, she seemed like she just needed time to get used to you and wanted to be friendly. I don't know if she was a stray or belonged to a local homeowner but she came around every day and even came the morning we left and led us down the lane. I would have loved to have taken her with us and given her a home if she had none....if you have any knowledge about her let me know..I would gladly come back down and get her...… Again, we thank you so much for letting us "borrow" your cabin for the week and would love to stay again next time we can come down to the area. We highly recommend it to others!!!!! We hope that we left everything just about exactly as we found it!!!!! Please contact us for special rates and payment options.